Shop our apparel catalog online or stop in our showroom to see samples. Forget about screen charges and set up fees with direct printing. Our state-of-the-art direct-to-garment printer puts your custom design on almost anything with a fabric surface. Print your business logo, photo, graphic image or words. Direct to garment printing stays on wash after wash. Direct printing doesn’t feel stiff like iron-on images. Direct printing does not require a screen so there is no set up fees or screen charges. Silk screen printing also available. Embroidery makes the best first impression. 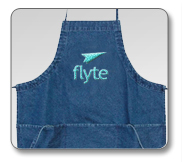 Our expert embroidery will make your logo and other personalization stand out. In-house embroidery is available on a wide variety of corporate or casual clothing and gift items for special occasions such as weddings, anniversaries and births. If you have a logo we can digitize it. If not, we can design a logo for you. We also have thousands of stock designs that can be customized to fit your personal needs. MacRay’s design services will help you to customize any item for your needs and view a digital image of your proposed design prior to its production. Stop by our showroom to see samples and the many designs that are available. Look professional with custom clothing for your business or organization. MacRay’s design services will help you to design custom apparel and products for your needs. You can even view an image of your proposed design prior to production.